Alessandro and Megan – thank you! We kicked off on the wines with a delicious bottle of Charles Heidsieck Blanc de Millenaires 1995. This is not a Cuvee I have had before but certainly one I would like to try again. A really creamy richness, quite “aged-DP” like. Little dash of iodine. All in balance and perfect now, some saline but mostly sweet fruit. The next wine was served “Blind” by Nobby. It had Pete and I in trouble from the off, we darted around Rhone, Rioja and Loire before having I revealed as Meursault 1er Cru Sous Les Bois 1995 by Robert Ampeau which was a surprise. There was a honeyed richness to the wine but with a herbal edge and an almost tea like quality. The “apples” in the wine became more toffeed with time. It was good and very interesting but I don’t think I’d rush out and buy more. Very old school and good for it. Better when cool where interestingly the Heidsieck was exception when still and warmer (always a good sign). The actual vineyard is interesting as I know it but only for red. Thierry Matrot makes a great 1er Cru Blagny Rouge from the site. Mouton-Rothschild 1996 – This is probably the most exciting bottle of left bank Bordeaux I have drunk in the last 6 months. Really great, classical cabernet, low alcohol, great moreish texture. Lovely balance of sweetness with a cedar note and a dash of ripe leather (if you know what I mean). My note has ‘more bordeaux should taste like this’ written across it. Best served in magnum I’d say a bottle not enough between three. Richebourg 1999, Domaine de la Romanee-Conti – Brooding and serious was the first thought. Just as it should be. Dense with rich black/red fruit. Incense, spice and a little tea. Over the 2 hours or so it was in glass the wine did relax and the fruit shifted from black/red to red/black. There was always a weight and texture to this. Very very fine and the wine of the day from an exciting future perspective. Does well to combine the freshness and focus of 1999 with the Masculinity of Richebourg, best re-checked in 3-5 years I’d say. Very fine and very generous. Still time before pudding for one more red – Barolo 1967, Giacomo Conterno – This was a decent but not exceptional bottle of this wine. It had real depth good acidic lift and a lovely grainy, bricky texture (an acquired taste for some). The fruit was on the redder/orangey side with a little ferrous element, some resin and sandalwood. Nice. 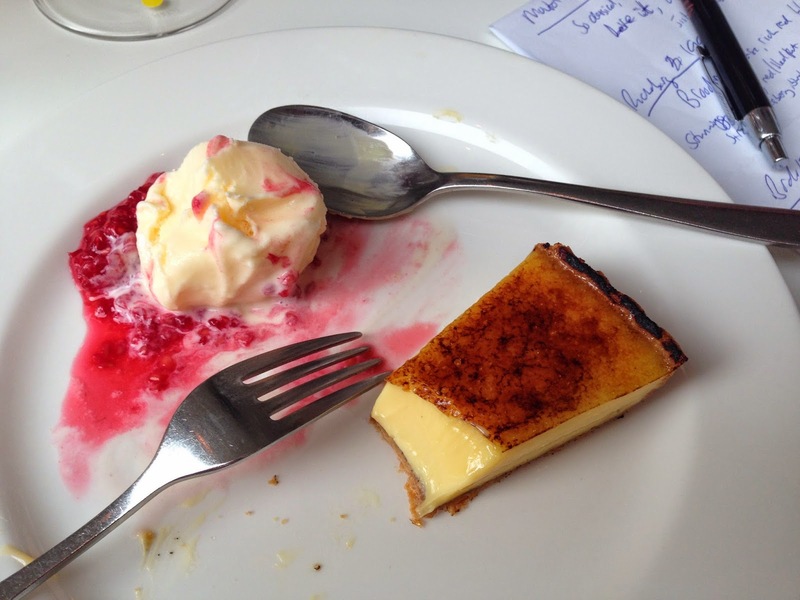 Nobby had pre-ordered a tart (Custard) for pudding and very sensible it was too as it is as good an example as it’s possible to get – Custard tart meets Creme Brûlée. The wine to accompany was Yquem 1995 in half bottle. This was deliciously opulent and a little like the Mouton just required no headspace, it is just a great drink. My note says “why keep?” not that you shouldn’t or couldn’t but I am not sure what would make this better. It isn’t profound but then most wine isn’t, it is “smiley juice” and that’s what matters. 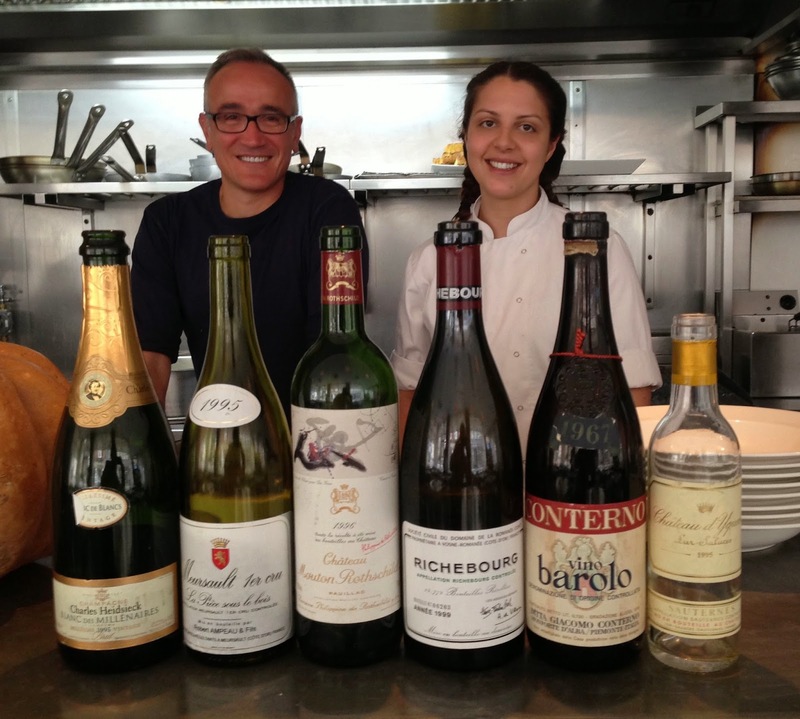 It was a great lunch with great wine, great food and cracking conversation…until next time!